The space shuttle is launching in a few minutes and on board are several space LEGO sets they are going to construct in space. Pretty cool and big news if you ask me for us LEGO fans. That is very cool and the first I've heard of it. Wonder if it's the shuttle set with stability issues - probably much more stable in zero gravity! I hope there is a video of them building it...imagine the price tag of the actual set built in space, if ever they auction it! In terms of more important matters, which sets? This article talks about which sets they will have. I can't tell if it is the normal shuttle or the large Lego-exclusive one. The small one pictured at the start of the article, that was on the shtutle flight back in November apparently, was never an actual set I don't think. They also talk about a space station set - I seem to remember seeing pictures of a Lego space station when the news of the Lego-NASA tie-in broke originally, but I guess it never got made into an actual set (at least not yet)? ^ That Brickset article does mention the ISS, but it also claims the small shuttle is to be released too. However, will that shuttle really be released as a set? The current shuttle is much larger, and uses the large prefab parts. And of course, there is the $100 one too which is even bigger and more detailed (and also appear not to be part of the proper NASA theme?). I remember being linked to a NASA website at some point on Brickset. Surprisingly I still forgot about that fun fact. That's the problem with early press releases, especially those that deal with the Space Shuttle. Launches are routinely delayed due to non-optimal conditions. I do remember the original announcement, but thought that the launch carrying the LEGO shuttle had already occurred! The Discovery launch in February had two "space shuttles built from 60" LEGO elements. So the first shuttle in the picture... is this an old set? Cool little shuttle. ^ I'm certain that this was never an official set. LEGO were probably told "we don't have much space, so design us a small one specially for the trip and we'll take it with us" ! If I recall, NASA previously brought some Life on Mars LEGO into space. The sets were then given away in a contest (which I didn't when - hence the lack of remembering the details). 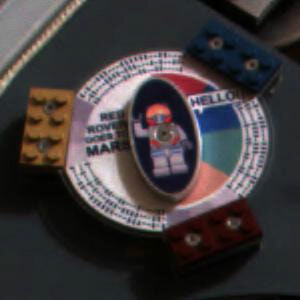 The article said that NASA placed a few Mars minifigs on the rovers up there... anyone heard of that before?